Det muslimske Brorskap – Egypts til tider meget populære og samtidig fryktede religiøse bevegelse – ble forbudt og forfulgt etter nåværende president El-Sissis maktovertakelse i 2014. Vi har sakset denne artikkelen om brorskapet i dag fra World Politics Review. Forfatterens navn blir av sikkerhetsgrunner hemmeligholdt, men artikkelen kan likevel anbefales all den tid den egyptiske statens holdning til brorskapet blir bekreftet av alle seriøse obeservatører. Artikkelen gir en oversikt over brorskapets historie før den går over til å diskutere dagens situasjon med en fragmentert ledelse og forbud mot offentlig framtreden. Tracking down the Society of the Muslim Brothers, better known as the Muslim Brotherhood, is a difficult task. Ever since the group was outlawed in Egypt following the July 2013 military coup that brought Field Marshal Abdel Fattah el-Sissi to power, those Brotherhood members who have not been killed, executed or imprisoned have kept their heads down. Inside Egypt, they generally refuse to meet or cancel at the last minute for fear of being identified and apprehended by the security services. Such is the extent of the government’s crackdown that, even abroad, they can be hard to find. Only those who have safely established themselves in exile, in cities like Istanbul and London, can be reached with any consistency. Just five years ago, the Brotherhood controlled the largest political party in Egypt’s parliament, the Freedom and Justice Party, which was formed after dictator Hosni Mubarak was toppled during the so-called Arab Spring uprisings. Its leader, Mohamed Morsi, had been elected president with just over 50 percent of the vote. In those days, the prospect of such a disastrous fall for the organization seemed decidedly remote. Today, however, as Sissi prepares to coast to a second term in elections scheduled for late March, the Brothers make up the largest portion of Egypt’s jailed generation of activists, students, union workers and government opponents. Death sentences are still regularly handed down against alleged Brotherhood members. The Brotherhood has by no means gone away entirely. That would be impossible for an organization that claimed some 2 million members in 2011. Because of its size and the social services it is known for providing, it still potentially has a role to play in Egyptian society. Yet the extent of the domestic repression and internal divisions the Brotherhood faces calls into question whether it can remain a viable entity. This is perhaps unsurprising in light of broader trends in Egypt in the aftermath of Sissi’s coup. Far from being an outlier, then, the Brotherhood’s weakened, fractured state makes it something of a microcosm of Sissi’s Egypt. The Muslim Brotherhood has been described by Olivier Roy, the French political scientist and expert on political Islam at European University Institute in Italy, as a cross between a modern political party and a religious order. The Brotherhood recruits new members, often at a young age, and inducts them into a hierarchical network of self-supporting “families.” Members of a family, which is usually made up of five to 10 people, take part in wird ar-rabita, a ritual prayer performed daily to encourage group bonding. The Brotherhood was founded in 1928 by Hassan al-Banna, a teacher and Islamic revivalist who had participated in the 1919 uprisings against British rule. At the time Egypt was nominally independent, but in practice British influence dominated political life. The movement was founded to resist British control and to counter what the Brotherhood saw as the malign, Westernizing influence of the Turkish nationalist leader Mustafa Kemal Ataturk, who had abolished the Ottoman caliphate in 1924 and was much admired by the Egyptian elite in Cairo. The organization’s main goal was to preserve and restore the centrality of Islam in Egyptian and Arab society. It developed formal leadership institutions and a highly concentrated mechanism for decision-making. Yet it worked within existing state structures, building support networks and charities to promote its name and supplying social services that the state either could or would not provide, such as medical care, community associations and schools in rural areas. The Brotherhood was, and remains, conservative and illiberal in its outlook, and some of the rhetoric used within the group is deeply distasteful to Western ears. It is committed to religion’s integral role in politics, and references to “Zionist-Crusader» plots are not uncommon. Women have traditionally been almost entirely excluded from any position of authority. At first, Egyptians seemed resistant to the Brotherhood’s message. But over time the group’s popularity grew, and its rapid growth in the late 1930s and 1940s eventually provoked a government ban on the organization in 1948, the first in what would become a series of periodic bans over the next 70 years. In response, a Brotherhood member, Abdel Meguid Ahmed Hassan, assassinated Mahmoud Fahmy Noqrashy Pasha, the Egyptian prime minister who was responsible for the ban; posing as a policeman, Hassan entered the Ministry of Interior headquarters and shot him dead. The following year, despite having publicly condemned the killing, Hassan al-Banna was himself assassinated in what was widely seen as a revenge attack. In the 1950s, under the influence of the Islamic theorist Sayyid Qutb, the Brotherhood became more radical and even less liberal, and was targeted in a widespread state crackdown in which thousands were arrested and six members of its senior leadership were hanged. The organization’s remaining leaders were forced into hiding and struggled to keep the group together. The Brotherhood was in effect refounded, with some of Qutb’s more radical theses expunged, in the early 1970s when Egypt’s third president, Anwar Sadat, released imprisoned Brotherhood members in the hope that they would serve as a counterweight to growing left-wing opposition. In the decades that followed, it was able to operate as a religious and social order seeking gradual political change with varying degrees of leeway from the authorities. The Egyptian state alternated between suppressing the Brothers and tolerating or encouraging their activities according to the shifting demands of political expediency, relaxing controls when the left and unions were thought to be ascendant and cracking down when they were not. Then came the popular uprising against Mubarak in 2011. The Brotherhood, which had for decades been dedicated to gradual change, was compelled by the fervor of the moment to present itself as a revolutionary organization despite years of operating within the confines set by the regime. In the aftermath of Mubarak’s ouster, as a well-organized opposition force that was willing to work with the Supreme Council of the Armed Forces, the military leadership that had seized power, it proved highly effective. Its party, the Freedom and Justice Party, won the largest number of seats in parliamentary elections in January 2012—235 out of 508—and its candidate, Morsi, won the presidential election in June 2012, to the chagrin of the rest of the opposition. Cairo, Egypt, Jan. 25, 2016 (AP photo by Hesham Elkhoshny). The Brothers went along with the army’s meddling in the post-Mubarak transitional period, even when the generals dissolved parliament in the middle of the presidential race. 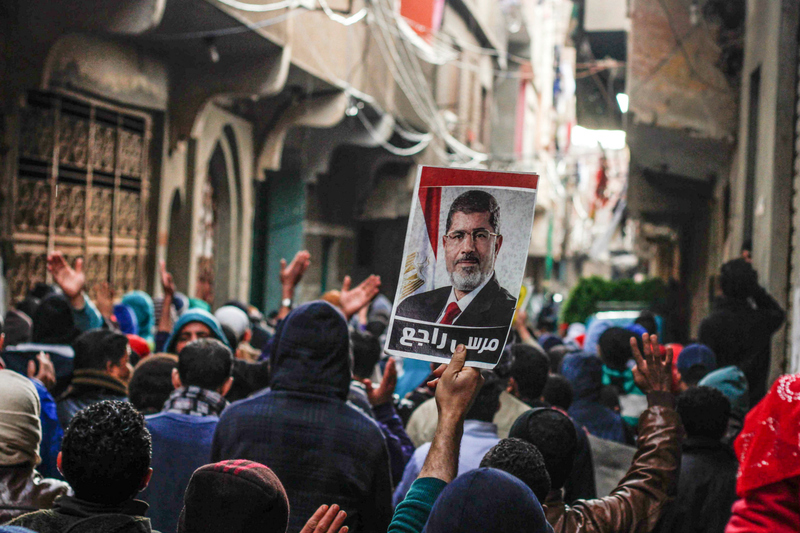 An uneasy ruling alliance subsequently emerged whereby the Brotherhood, with Morsi as president, fronted a governing system while the army retained overwhelming influence. Prominent Islamists both inside and outside the organization warned that this arrangement was a trap for the Brotherhood, and the warnings proved accurate as the Brotherhood’s inept political management ushered in a return to street protests in 2012 and 2013. On July 3, 2013, the army used the protests to justify a military coup, arrest Brotherhood members and other opposition activists en masse, imprison its leadership and massacre thousands of its supporters in the streets. Around 1,000 Brotherhood supporters were killed in Cairo’s Rabaa Square on a single day in August 2013. 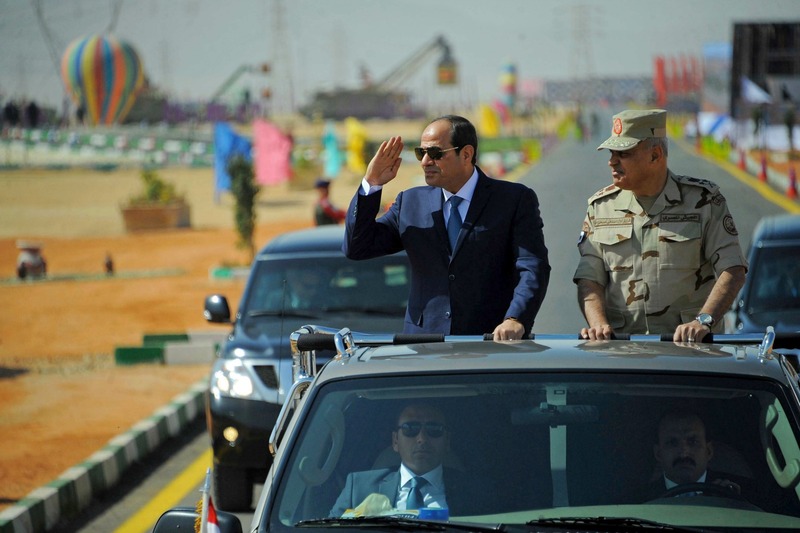 Since then, the military-run state, with Sissi at its head, has established a dictatorship that is more repressive by far than any in Egypt’s modern history. The Brotherhood has been banned once more, while the state has launched a devastating crackdown on the group—as well as all other forms of opposition—that has all but destroyed its ability to function within the country. The experience of having temporarily achieved power only to quickly suffer catastrophic defeat has prompted new fissures to open up within the organization, throwing its traditional hierarchy into question, according to senior Brotherhood figures. Amr Darrag is a former leader of the Brotherhood’s political party, the Freedom and Justice Party, which the organization founded after the uprising in April 2011. Having fled into exile after the military coup, he was appointed in 2014 to head the political operations of the Brotherhood’s bureau in Turkey. He subsequently resigned from the post last year in protest against the central leadership. He currently runs a Brotherhood-aligned think tank in Istanbul, and his current position in the wider Brotherhood movement, like that of many former leaders, is ambiguous. Others trace the Brotherhood’s divisions back to 2010, when Mahdy Akef, who at the time held the movement’s top leadership position, was forced to step down in an internal power struggle, a first for a supreme guide. Akef had been regarded as accommodating and, by Brotherhood standards, progressive for his advocacy of free speech and democratic participation. He was succeeded by Mohamed Badie, a more conservative and less politically astute senior Brother who, despite having been jailed in 2013, nominally heads the movement to this day. According to Darrag, the traditional leaders of the Brotherhood, best represented by Badie, had fallen into a pattern of acquiescence to the Mubarak dictatorship. There was an unwritten understanding that caused the group to limit its activities and waste opportunities to challenge the system. This inability to capitalize on political openings continued after the uprising, when the Brotherhood underestimated the strength of the “deep state” that sought to undermine it. “Then came the coup and it was clear there was a need for major changes within the movement. You can’t just maintain everything as business as usual,” Darrag says. After the coup, a so-called New Guard within the Brotherhood, with which Darrag identifies, became disillusioned with the leadership, creating a split that remains unresolved. The Brotherhood’s experience of achieving power only to quickly suffer catastrophic defeat gave rise to new fissures. Darrag says many of the movement’s failures can be ascribed to factors such as the old leadership’s sclerotic decision-making, refusal to consult youth members and lack of political savvy. The dissidents, he says, forced secret internal elections within Egypt to man a new Shura council—the organization’s internal bureaucracy—and temporary leadership bureau, effectively establishing parallel Brotherhood structures. For those who subscribe to the idea that the Brotherhood has effectively split in two, the old guard is best represented by the head of the Brotherhood’s London bureau, Ibrahim Munir; the organization’s secretary-general, Mahmoud Hussein, who is based in Turkey; its acting supreme guide, Mahmoud Ezzat, whose current whereabouts and status are unknown but who is believed to be in hiding in Egypt; and Badie, who is incarcerated in Tora prison on the edge of Cairo. The new guard, however, is more amorphous, and there is an apparent absence of major personalities who can be identified as leaders, calling into question the extent to which an actual split has occurred. Indeed, some in the Brotherhood reject Darrag’s description of what has happened. Ammar al-Beltagy, the son of the prominent Brotherhood leader Mohamed al-Beltagy, says talk of major divisions within the organization is exaggerated. Like other intellectuals with ties to the Brotherhood, his current relationship to it, based on his own description, is complicated. “I’m not Muslim Brotherhood, and I’m not not Muslim Brotherhood,” he says. Nevertheless, he is confident in describing its internal politics. Because of the Brotherhood’s size, he says, it is only natural that there would be some disagreement. “The Brotherhood is a large organization with several wings, several groups, even several ideologies—it’s nothing new, it was always so,” he says. In a report published last November for the Hudson Institute, a Washington think tank, Mokhtar Awad, the Egyptian researcher, argued that one potential source of division within the Muslim Brotherhood centers on the question of whether it should violently confront the Sissi regime. In the 1950s and 1960s, when the Brotherhood was faced with an aggressive military-led purge, the question of violent resistance emerged as a central debate within the movement. According to Awad, Sissi’s massive crackdown has made the debate relevant again. Sedki Sobhy, Suez, Egypt, Oct. 29, 2017 (MENA photo via AP). The Brotherhood is officially nonviolent, but violent groups that are widely believed to have either splintered from the Brotherhood or to have some ties to it have been operating in Egypt since Sissi’s coup. According to Awad’s research, Mohamed Kamal—who was once the most prominent member of the Brotherhood’s guidance bureau, the top leadership council—led a faction of the Brotherhood that formed “special operations committees” to carry out violent, politically motivated attacks beginning in mid-2014. Kamal was killed by security forces in October 2016. In June 2015, a small group of Muslim Brotherhood youth are believed to have assassinated the prosecutor general, Hesham Barakat, with possible coordination with Kamal’s special committees. And going back to 2014, groups with names like Popular Resistance Movement and Revolutionary Punishment have carried out sporadic attacks on security forces in central Egypt. They have used symbols that resemble the Brotherhood’s, though their connection to the Brotherhood is unclear. One such group, Haraket Souad Masr, or the Armed Egypt Movement, better known as Hassm, first appeared in Egypt’s Fayoum province in central Egypt in 2016 and has targeted police at checkpoints and with improvised explosive devices. Another prominent group, Liwa ath-Thawra, or the Revolution Brigade, has assassinated senior military officers and attacked security forces across Egypt since August 2016. Analysts believe the latter group has, at the very least, recruited from the Brotherhood’s ranks. The experience of exile, with leaders scattered primarily in Turkey and the United Kingdom, has posed a fundamental challenge to the Brotherhood’s internal coherence—one it has strained to overcome. In 2014, in an effort to keep the movement together after the military coup, the Brotherhood convened a summit at the Retaj Royale, a hotel on the outskirts of Istanbul. There, it formed an organization called the Egyptian Revolutionary Council, a political organization intended to be the Brotherhood’s front in exile. The council sought to oppose Sissi’s new regime and attempt to draw international support, but it soon fizzled out. From Turkey, the Brotherhood has founded media organizations and satellite television stations, including the well-known channels Rabea TV and Mekameleen, to push its agenda. Yet despite these efforts, members of the Brotherhood in Turkey say the organization has struggled to form the kind of united opposition in exile that outlawed groups elsewhere in the world have achieved in the past. For some Brotherhood members, Sissi’s crackdown has rekindled debate over whether resorting to violence is justified. As the Muslim Brotherhood’s period in the wilderness drags on, its very survival may be at stake. The chaos of recent years has led a number of members to abandon the organization completely. Unless the Brotherhood makes a concerted effort to overcome internal squabbling and refashion itself as a broad-based movement capable of accommodating different points of view, el-Nemr argues, it will be hard to regain its former influence. While the Brotherhood has retained the support of Qatar and Turkey, since the coup it has failed to garner the type of support from the United States or Western Europe that could, because of those countries’ diplomatic and economic weight in Egypt, force the Sissi regime to revise its hard-line stance. Conservatives in the United States, including within the administration of President Donald Trump, have called for the Brotherhood to be designated a terrorist organization, as it already is in Egypt, Saudi Arabia, the United Arab Emirates and Syria. For those optimistic about the Brotherhood’s future, its current travails can be seen as a second iteration of the group’s experience in the 1950s and 1960s, after the Egyptian state first began cracking down: a long but ultimately temporary hiatus. But revival is by no means assured. A Brookings Institution survey of Brotherhood figures and Islamists recently found that respondents believed there was a 50 percent chance of the group splitting into two or more distinct organizations. Whether the Brotherhood can emerge from the wilderness in any form, let alone whole and intact, remains to be seen. The military authorities are certainly showing no signs of easing the pressure. Ultimately, the question of the Brotherhood’s future may be one that can only be resolved along with Egypt’s as a whole.